Home Opinion and Editorial Man’s Best Friend or Man’s Best Livestock? Pennsylvania, especially Lancaster County, is well known for its puppy mills. Puppy mills are breeding factories for puppy wholesalers. The Oprah Show featured a special on puppy mills with reporter Lisa Ling traveling to Lancaster Country, the center for Puppy Mills in Pa and the east coast. After watching the episode, I was astounded by the conditions of puppy mills in my own state. The dogs are treated like livestock – not like pets. Many of the dogs live and die in the same small cage, never getting the chance to step a paw on fresh grass or to be lovingly cuddled. Female dogs are treated like cattle or worse. They give birth as many times as is possible in their life, then they are disposed of like an old cell phone. In Pa dogs are considered a cash crop and can be destroyed once they no longer can produce a profit. Thinking of buying your next dog from a pet store in Pa.? Do some research and make sure your puppy has not come from a puppy mill. 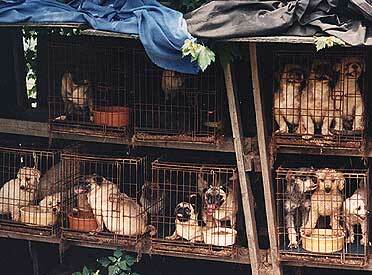 Many puppies from pet stores are from puppy mills. The best way to find the breed you are looking for is to search different shelters, and the best way to stop puppy mills is not to buy from them. There are also groups that rescue dogs from puppy mills and need to be adopted. WolfSpirits Puppy Mill Rescue located in Canton, Ohio, rescues toy breed puppies and dogs and places them in foster homes until adoption. Main Line Animal Rescue in Chester Springs, Pa. is fighting for better conditions in puppy mills by educating the public of “the horrors” of Pa.’s puppy mills. Purchasing a puppy from a pet store is giving it a home but also could be funding puppy mills. Let an older, disabled, or unwanted dog have a chance of getting a caring home. When searching for the right puppy or dog, adopt!